Elon Musk Hails Tesla Reaching Goal Of 5,000 Model 3s A Week The electric vehicle maker missed its original goal of producing 5,000 of its lower-cost models by the end of 2017. Musk has said meeting that target is crucial to the company's success. 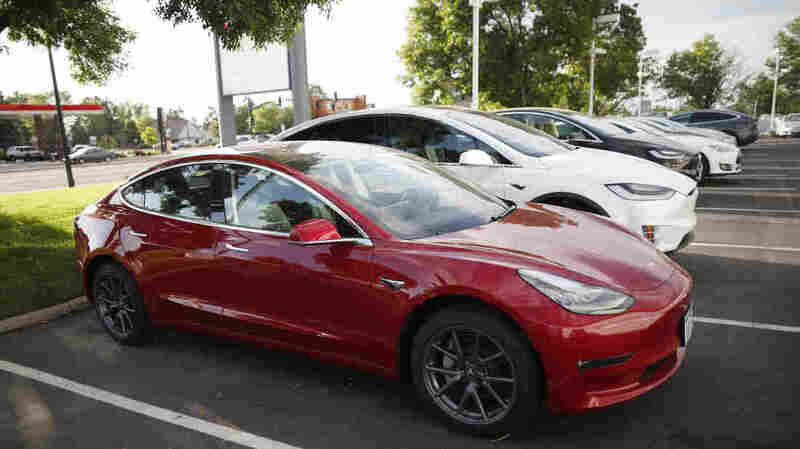 In a photograph from May, a 2018 Tesla Model 3 sits at a dealership in Littleton, Colo.
Musk also said Tesla had produced 2,000 Model S sedans and Model X sport-utility vehicles in addition to the Model 3s, bringing total production to 7,000 vehicles a week. "The self-imposed target was introduced about 6 months ago after Tesla missed its original Model 3 production goal in December 2017. Model 3 production had already significantly increased over those 6 months, but Tesla had heavily invested into a production capacity of over 5,000 units per week and it needed to get there in order to turn a profit on the vehicle program." The Model 3, a relatively low-cost model for Tesla, is meant to transform the company from a niche maker of expensive, high-end, vehicles to a major car manufacturer. The Los Angeles Times writes, "Optimism about the Model 3 transforming Tesla into a much bigger carmaker that sells to the mass auto market sent the company's market capitalization past Ford Motor Co. and General Motors Co. for the first time last year. Though the production hiccups have led to tumultuous periods for the shares, they're now up 10% this year, and the company is valued at $58.2 billion." As The Associated Press reports, "Last summer, when the first Model 3s began rolling off the assembly line, Musk promised to build 5,000 per week by December and 10,000 per week in 2018. But he also warned at the time that Tesla was entering at least six months of 'manufacturing hell' as it tried to hit the targets." In the email, Musk wrote that production could hit 6,000 Model 3s a week by next month. "Now that Tesla has achieved the 5,000 mark [for the Model 3], it needs to do so on a steady, routine basis and with excellent quality," Michelle Krebs, an analyst with car-shopping website Autotrader, was quoted by The Los Angeles Times as saying. That is a sentiment shared by Dave Sullivan, manager of product analysis at market research firm AutoPacific Inc.
"Reaching it is one thing," Sullivan told the AP. "Consistently producing 5,000 per week with outstanding quality is another. I don't think producing 5,000 once is anything to get excited about until it's repeatable." The Model 3, which is built at a factory in Fremont, Calif., retails for as low as $49,000, according to the AP. "But some could be getting antsy, especially those who want a price closer to the base of $35,000," the news agency writes. "Many have been waiting since March of 2016, when Tesla began taking orders with a $1,000 refundable deposit." As we reported last month, Tesla announced that it had laid off 9 percent of its workforce in what Musk described in a tweet as a "Difficult, but necessary Tesla reorg ..."
The company posted its first quarterly loss, of more than $700 million, earlier this year.